I suppose your question is about acne scars because you appear to refer to subcision. For deep acne scars, I recommend to use a 1.5 mm dermastamp or the single needles. Infadolan is a protective and regenerative ointment that should be applied (just a little) immediately after rolling with long needles (longer than 0.5 mm). Initially the skin is dry and rough after rolling and should be well protected. After a day or two (depending how quickly you heal) you can start your normal routines (except for peels or harsh exfoliation). Antioxidant creams do not interfere with collagen production, you can use your regular creams without any restriction. I know that Aquaphor is often recommended for first two days after Fraxel laser but I think it is also an ointment. If protective ointments cause you breakouts, use a cream that you already know doesn’t cause you breakouts. It is very difficult for me to name any because some acne sufferers claim breaking out after creams that didn’t cause breakouts in other acne suffers so it is more a matter of individual experience. I'm sorry - I totally overlooked your question! The best is to pre-treat with vit. A. We now sell Tretinoin gel for pretreatment (also very suitable for acne-prone skin). However, Tretinoin, AKA Retinoic Acid is acidic and is not suitable to be applied immediately after rolling - especially not on the face - because it will sting and irritate the skin. Infadolan is a protective, regenerative ointment with a non-acidic form of vit. A and it is suitable for immediate application. You can replace it with something you know doesn’t cause you break outs but preferably it should be in a tube because creams in tubes cannot get so easily contaminated as creams in jars. Hydrating creams are not very suitable for this. Hydrating creams saturate the skin surface with water which makes the skin look temporarily better but this very temporary hydration actually increases the evaporation of water from the skin! After several hours you end up with drier skin than you started with. Then you're forced to again apply hydrating cream and the vicious circle continues..
A good moisturizer locks water into the skin, it prevents its evaporation. It needs a certain amount of oil to keep the moisture in. It is very important to keep the skin moisturized after dermarolling. If you are prone to acne, apply a more "heavy" cream at least one or two days after rolling with long needles (longer than 0.5 mm). If you pre-treat with Tretinoin, then apply Infadolan (or another heavy cream) immediately after, there is no problem to go for a few days without application of vit. A. After 2-3 days you can restart with Tretinoin. >order to repigment the areas. You should first try single-needling the scars. That by itself often triggers or "wakes up" melanocytes (skin pigment producting cells). You should needle the white patches and also needle a little over the edges of the white patch to facilitate the migration of melanocytes from the surrounding normal skin into the white patch.When you complete several needlings, expose your scars to the sun because melanin is produced as a reaction to UV (provided there are melanocyte cells in the area to produce it). If you do not get results, needle your scars and immediately roll all over the area with a 0.5 mm roller. The melanocytes are at the bottom of the epidermis, which is about the depth to which the 0.5 mm roller penetrates. You can also disinfect your thigh for example, needle the scars and then roll on your thigh with 0.5 mm to hopefully harvest some melanocytes - then roll over your scars to hopefully implant them. Repeat this harvest/implant procedure several times during one procedure. Or needle the hypopigmented spots a little to prepare them, then attempt the melanocyte transplantation with the single needle only - insert it (not too deep) into the disinfected skin with normal color and then back to the hypopigmented spots. Repeat this, there and back, many times. Here follows an interesting method of melanocytes transfer but I am not sure whether it is doable for home treatment. I have to think about it. Instead of dermabrasion at the recipient site, needling would be performed (that is better) but I still have to solve the problem of how to safely harvest melanocytes with this method without risking a scar. You are lucky because your scars are quite minor. Dermarolling works for all types of acne scars however you should not expect complete disappearance of the scars. Just improvement. In successful dermarolling cases, acne scars soften, they fill in and thus become less indented - if they are darker their color improves and the overall texture evens. The skin consists of three main layers. The epidermis, dermis and subdermis. Acne scars are in the dermis and you need a needle length to thoroughly reach the dermis. Use a 1.5 mm normal-width roller. Use a 1.5 mm dermastamp. Use a 2 mm single needle. Rolling with 1.5 mm can be quite painful, especially before you get used to it. Lots of people roll without a numbing cream and they claim it is bearable. Other use an ice pack or a numbing cream (we sell EMLA). I personally can roll my entire face without EMLA, with the exception of area above the lip. In your case, I would recommend a 1.5 mm dermaroller. Roll quite densely over your cheeks every 3-4 weeks. If you get no improvement after 4 rolls, start to needle the individual scars with our custom-made single needles. Single needling is the most intensive and targeted treatment for scars. In case of more serious acne scars than yours, I recommend a derma stamp, which you can combine with single-needling, especially if the results are not as hoped for. Unfortunately, just like with any other method, including an expensive dermabrasion or laser resurfacing - not everybody achieves results but if you are patient and do not give up too early, you should achieve noticeable to strong improvement. Your post-acne spots and moderate redness (or is makeup/a photographic artefact?) may be improved by Tretinoin gel (also available from us). Tretinoin's primary indication in dermatology is acne. Tretinoin speeds up the skin's turnover and it thus keeps acne under control, unclogs pores, and speeds up the diminishing of pigmentation, etc. Both dermarolling and Tretinoin speed up the skin's turnover (renewal), which helps with many skin conditions, but it requires extra moisturizing and remember that the more is not always the better.. If you can spare 2 more dollars, also buy our vit. C powder for a homemade vit. C serum, since vit. C is needed for collagen synthesis. There are reasons why you should really make such a serum yourself, having to do with stability and purity. Some people achieved amazing results with dermarolling such as the lady on this photo. She is not our customer, neither do I know the doctor who performed her procedure. I just wanted to show that such results are possible. Even though your scars are incomparably less severe than hers. The reason we are twice as cheap as the world's cheapest supplier (incl. shipping cost) is that some tubes may have some (harmless) dents in them. We charge 13 dollars. There is one online pharmacy that charges less, but that's just a trick because when you checkout, you'll find that shipping is 25 dollars, so even when buying two tubes, we're the cheapest in the world. We charge $2.50 for shipping to the US and $2,- to Europe. Retin-A repairs photodamaged skin, improves fine lines and wrinkles, unclogs pores and black heads, controls acne, helps eliminating acne spots and evens out skin coloration. It improves the appearance of fresh stretch marks and to a lesser extent of old stretch marks. For most conditions, the effects of Retin-A will only appear after several months of use. Excellent for dermarolling pre-treatment of face, scars, stretch marks, skin with lost elasticity and unwanted pigmentation. Only a pea-size amount of gel should be used to spread on the entire face. Using more may cause irritation and redness. Make sure the skin is dry before application. Since Tretinoin is sun sensitive, apply before bedtime and use a high factor sun screen over the next days. In the beginning, do not apply daily. Start slowly. Apply every three days, then gradually every second day, etc. Tretinoin will likely make your skin peel. To avoid peeling of your fingers, wash your hands after applying the gel. If skin redness, irritation or excessive peeling occurs, decrease the frequency of application and the amount of the applied gel. Do not apply immediately after dermarolling, because it will sting. Wait at least until the day after. If used for acne the condition may worsen at first and improvement comes later. Keep the skin moisturized. Vit. A is fat-soluble and can be applied together with other creams. Do not apply if you are pregnant, lactating or planning a pregnancy. You'll find that typing for example "Dermal Integrity" into "Establishment name" yields zero results, meaning the company has no FDA-registered devices. When a company lies about FDA approval, what else are they lying about? Sure, most rollers come in boxes with the FDA seal on them. I don't know what the FDA can do about that, since they can't possibly open all mail and verify all stamps and seals. There is very little they can do against a Chinese eBay seller anyway. There are a ver few real real brand names in the roller world. Apart from Dr. Roller, Original Dermaroller, and SRS Micro Meso, there exist no other brands of dermarollers. The Scientia roller, for example, is just an overpriced Dr. Roller with the cardboard packaging removed. All other dermarollers except the forementioned three are generic models made in China. They come in generic plastic boxes and are packaged in generic cardboard boxes. However, any company ordering a few thousand of those rollers will get branded versions, typically a brand name on the roller handle, a brand name on the plastic box or a customized box, plus a customized cardboard box. 3. They claim patented or patent-pending manufacturing processes. Apart from the Original Dermaroller™, no other rollers have any patents on them, because China - the country that produces them - does not even honor international patents, in practice. So the factories don't bother with for example a very expensive US patent. If they claim patents, ask for their patent number(s) so that it can be verified. 4. They say they only sell certain needle lengths to medical doctors, but if you try to order, there is no verification that you are indeed a doctor. They have this bogus restriction to gain trust with the customer and create a desire to purchase the "medical-grade" roller. When the customer attempts to order the roller, all that is required is to tick a box saying: "I am a medical doctor" for the rollers with long needles. No dermarollers are produced in the US or Europe. All rollers are made in China or Korea. Not that this matters, but it's just a trick to gain customer confidence. 6. They claim a unique invention, such a "special needles", "more needles" or "special light". 7. They make many unverifiable or vague statements to make their product seem more attractive. Such as "quick results", "doctor-directed", "natural, high tech skin care technology", "high quality polished Swedish stainless steel", "unique quality control serial number", "unique patented ergonomic design by award-winning designer", "medical grade plastic", "no <fill in scary term>"
8. They are too dismissive of competing rollers, claiming they will "rust" or "dull quickly". 9. They have many glowing testimonials on their site. A. Permanent results only come after at least half a year of rolling - regardless what they'd like you to believe. B. If any enthusiastic testimonials are received before that, then it is unethical to publish those rather premature testimonials, because they're due to temporary puffiness or other transient effects. C. After a half a year or more of rolling, customers are unlikely to send in testimonials any more. We have sold many thousands of dermarollers, and we hardly ever received a "raving testimonial" of the type we read on the scam sites. We do not believe that the sites selling those over-priced rollers publish real testimonials. Some sites haven't even been selling rollers for more than a few months and they already have testimonials about "amazing results". Testimonials really don't make much sense, for dermarollers. Any decent dermaroller will give similar results. All that counts is the price and that it's not of inferior quality. And of course that you stick to a good treatment regimen, such as our dermarolling instructions>. Incidentally, we've noticed that the "brand names" are putting our guidelines online in a "spun" (rephrased) form. It's still very recognizable in some cases. They had to "spin" them, because we forced them to remove literal copies. We worked hard on our instructions - an ongoing project. We resent that others pretend to be knowledgeable by publishing rephrased versions of our research. 10. They have very many before-and-after pictures on their site. It is very hard to acquire good before-and-after pictures. A customer has first to religiously stick to an optimal treatment schedule for a year or so, then decide all by themselves to send in high-resolution, sharp, well-lighted pictures, and trust and agree that the photo's can be used on some commercial site, as long as a small black box is placed over their eyes. Nearly all those pictures are copied from course books on dermatology and plastic surgery. That's why they're all uniform-looking with similar background and lighting and you don't see a Copyright message on them such as on our pictures that really do come from happy customers. If it weren't for the big "Vaughter Wellness" text on our pictures, they would be plastered all over the Internet by now. 11. They claim that most dermarollers have 0.15 mm thick needles that last shorter, and that 0.3 mm is better. 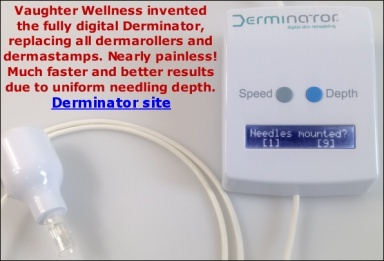 We have tested many dermarollers in our dermaroller review and we did not find any roller with 0.15 mm needles. To our knowledge, nearly all dermarollers available in the market today have a needle thickness of 0.25 mm and the reason is that scientific research found that that is the ideal thickness for microneedling. 0.3 is the upper limit (such thick needles increase the risk of scarring) and 0.2 mm is the lower limit (lower than that and the beneficial effect of collagen regeneration is sub-optimal). So this is a myth in order to spread suspicion against the other rollers. As an aside, 0.15 mm needles would bend very easily. 12. They claim that their rollers last a full year or longer. This is always a lie, because technology is not yet so advanced that they can produce non-blunting metal needles for affordable prices. Needle tips are only a few molecules wide at the end and they always blunt after a few thousand skin penetrations. Perhaps there exist an exotic material such as ceramics that blunts slower, but there exists no special dermaroller today that lasts longer than about seven average treatment sessions, meaning that you roll not a tiny patch of skin and not a huge area such as your entire chest. Don't forget that these plastic dermarollers are originally intended to be used only once - they are intended to be sold as disposable rollers for clinics. Noone can claim that their rollers last "more than one year". All needles blunt and how fast they blunt depends on how much you roll. One year is only achievable when you only roll small areas - infrequently. 13. They claim that dermarolling does not hurt and that numbing creams can damage nerves. This is totally false. Dermarolling hurts - a lot. Even rolling with a 0.5 mm roller hurts. Many say: "It hurts like hell". The only possible reason someone would want to claim that dermarolling doesn't hurt or is only "slightly painful" would be to sell more rollers. Dermarolling is as painful as those needles look! No point in denying that. If you are scared of pain, don't roll or use ice packs or a numbing cream. If you want to look better, you'll have to suffer. No free lunch. Most competitors find it impossible to supply numbing creams because they are prescription-based in Europe, China refuses to dropship them due to frequent confiscation so there are very few places that still dropship them. In fact only one company in the world still does this. So White Lotus, unable to sell numbing creams and afraid people will buy the entire order from another vendor, simply claims that dermarolling doesn't hurt. Their site is full of scary warnings to warn against everything that doesn't fit their business model, such as "There is scientific evidence that numbing creams can damage local nerves". Funny how they never give a link to such "evidence" - because there is none. Microneedling devices should be thoroughly cleaned after use by rinsing it in warm soapy water first and then immersing it for at least half an hour into a > 60% alcohol solution or some other kind of sterilizing agent such as Chloramine-T (cheaper and more effective than alcohol). Merely spraying the needles is not enough by far, as the alcohol evaporates before the bacteria die. It takes a long time to really sterilize (as opposed to merely "disinfect") something with alcohol - a few seconds of spray won't cover every part of the needles fully. The reason they sell a tiny spray bottle for several times the price of a large bottle with denaturated alcohol from the pharmacy is because they can make good money with it. They can't make money with a large bottle of disinfecting alcohol - you can buy that cheaper in a local store. But that's exactly what you should do, if you want to properly disinfect your dermaroller. If you want to go one step further and sterilize your microneedling instrument, you should use Chloramine-T.
Of course, such wild, unsubstantiated claims sell more rollers. they know very well that dermarolling can't augment breasts, so they are careful to call it "Breast Enhancement Acupuncture". Buyer beware - at the time of writing, they sell a dermaroller that costs 3 dollars bulk wholesale and a needleless massage roller, plus a tiny "serum" bottle for $139.95. That's $9.95 worth of value and $130 profit. And if you use the roller to increase the size of your breasts, it's not even worth $9.95 - it just won't work. 16. They claim that vitamins can be harmful, when used with dermarolling. Probably because there is little profit margin on pharmaceutical vitamins (because they have to be purchased from a pharmacy first) and there is much more profit on self-produced "serums", White Lotus claimed that vitamins are bad because they are "artificial" and they can cause liver failure and whatnot. Because the skin is 1000 times more "open" and the vit. A will damage your liver, etc. First of all: You need so much vit. A to cause liver damage that if you would eat a hundred tubes of vit. A cream, nothing would happen. Scott's South Pole expedition ended badly and that was partially due to vit. A poisoning. They had been eating polar bear livers for weeks, ingesting absolutely huge amounts of vit. A, millions of times more than is in an entire tube. Secondly: Vit A cream is not used directly after dermarolling! So their scaremongering is based on a straw man, a false premisse, a red herring. For the rest: It has been proven many times in a clinical setting that vit. C and D is very beneficial and even essential to healing skin. The same with vit. A. "artificial" or "natural" are meaningless words without exact definitions. Uranium is natural, would you eat it? The vit. C we sell is 100% medically pure L-Ascorbic acid crystals, purer than found in nature, achieving great results in medical trials. Of course there is little money to be made with vit. C, hence the disinterest on the part of White Lotus to sell it, because if they charge too much, anyone can see that and buy it locally. Our vit. C sells for three dollars. Instead of lying to our customers and squeezing the last drop of cash out of them, we chose to simply provide whatever has been proven to be beneficial, for an honest price - our cost plus a modest percentage. 17. They sell tiny bottles of expensive, self-made "enhancement serums" with extracts of some cheap herbs of which the efficacy is wholly unproven. You know how you can immediately recognize dermarolling scammers? They sell their own "miracle serums" instead of clinically proven vitamin creams and ointments. Vitamin creams are expensive. They are made in pharmaceutical companies and sold in pharmacies. They have proven themselves in countless medical studies and conform to strict quality requirements. Such vitamins are expensive and not much money can be made with them, hence the need to sell self-produced "serums" that cost nearly nothing to produce and can be sold at a huge profit margin. The most expensive part is the bottle and the cost of shipping. Stay far away from those peddling their own serums, potions, herbal extracts and essential oil mixtures. Scientia sells self-branded multivitamins for a dollar a pill (30 dollars/month) that cost 50 cents a bottle wholesale. Made in China. Buyer beware - source your multivitamins from a reputable Western manufacturer, not from a 20-year-old in Hong Kong. Such advice will ruin your skin instead of improve it. The full cycle of collagen regeneration takes months - many months! All such advice does is sell many more rollers because the more often you use them, the sooner they get blunt. This advice is either based on ignorance or malice. Highly likely it's either a bacterial or a fungal infection. I'd wager bacterial, having developed inside the powder. You should keep the area dry. And use Betadine cream on it. Being Iodine-based, it effectively kills both fungi and bacteria. If you can't get Betadine, try another Iodine-based cream. Wash it in very hot water with dishwashing liquid and keep it in a place where it dries very quickly. “After brushing, wash the brush with dishwashing liquid in near-boiling water or put it in the dishwasher. Store the brush in a place where it can dry quickly. Yes. Flakes are just pieces of “dead” skin which are being replaced by new skin. Dermarolling speeds up skin turnover so the renewal of the skin happens much quicker than normal. The old pieces of skin are being shed. Dermarolling causes intensive exfoliation especially if you also use vit. C serum. No problem with rolling but if your skin peels a lot, give it a rest. There is no reason to cause more exfoliation if there is already a lot. Only if your flakes are caused by a skin disorder or an infection (such as psoriasis or eczema) you should not roll. Dermarolling speeds up the skin's turnover. In other words, it speeds up the skin's renewal. It basically makes the skin peel a little and the dry flakes are getting replaced by new skin. More frequent rolls are good for aging skin because as we age, the natural renewal of the skin slows down. If you are a young girl, your skin renews regularly so you do not need to roll your face that often, unless you are trying to get rid of pigmentations, uneven skin tone etc. You should reduce the frequency of rolls, dilute the vit. C serum with more water or reduce the frequency of application and keep the skin moisturized. One of the best skin moisturizer is almond oil. Wet a cotton pad with tap water, add some almond oil and clean your skin with it. The same goes for exfoliation. It makes the skin glowing but overly frequent exfoliation might temporarily cause dry skin. The same with overly frequent acid peels. If you do not roll too often, it might be that the vit. C serum is too strong. Just dilute it with water. It will sting because Retin A is acidic. After you apply Retin A, wait for about ten minutes and put a thin layer of Infadolan as protection and moisturisation (an ointment, contrary to a cream, prevents moisture loss by providing a barrier). The scar should not become dry - keep it moisturized with our occlusive ointment. This is very important. In several days it will likely start peeling. Don’t forget to pre- and post-treat the scar with vitamin C serum. The stretch mark will turn very red and will stay red for many days. Then it will slowly revert to its original state. It may take months to see improvement from this treatment because the remodeling of the scar will take months to be completed. Stretch marks are extremely difficult to improve and very intensive and repeated treatments are necessary to achieve improvement. Needling the stretch mark targets exactly the depth of the skin where the stretch marks are and the regeneration will happen in the deep layers of dermis. You cannot remove the crack in the skin (stretch marks are skin cracks) but you can greatly improve its appearance and shrink both its width and depth. Single needling is the most targeted and the most effective. It crushes the hardened collagen, it goes deeper than a dermaroller, you can needle very densely, and to different depths and from different angles. Unfortunately, a 3-liner cannot substitute this. The problem with vit. C is that it is unstable and it is quite difficult to stabilize it. By the time a vit. C cream or serum gets to the customer, the vit . C in it might be totally useless, especially because I don't believe that those serums are refridgerated during storage and transport. That is why we prefer our customers to make their own fresh serum every two weeks and keep it in an airtight container in the fridge. Making your own serum also enables you to make a high percentage of vit. C. There is nothing easier, cheaper and more reliable than simply to mix some Ascorbic acid crystals into lukewarm water and using that. 100% pure vitamin C, and vitamin C only - exactly in the concentration your skin can just endure well, after micro-needling. Your serum doesn’t say how much vit. C it contains. The ingredient list on products is listed in descending order of contents. So it most likely doesn’t contain much vit. C. I don't like such a huge ingredient list either, when the goal is just to apply vitamin C. Some of those ingredients are totally OK, but some may interfere with its absorption. If you look at how much vit. C you get for your money, then you are extremely much better off buying ours. You can make a much larger quantity of stronger vit. C serum for the same price and I think we're cheaper with shippign as well, since our vit. C fits in an envelope, sent by ordinary mail. I think it's 3.5 dollars incl. shipping..
>dermaroller that I ordered from you this summer. >of dermarolling on the scalp. The most effective is to roll with a 0.2 or a 0.5 mm regular dermaroller (to enhance Minoxidil absorption) and apply Minoxidil right after dermarolling. Minoxidil doesn't grow new hair (such a miracle doesn’t exist yet) but it prolongs the growing phase of the hair. Hair cycles - it has active and dormant phases and by prolonging the growing phase, there will be more hair on your scalp. Also, Minoxidil (especially the high percentages from 5%) sometimes/rarely thickens facial hair, which is not an appreciable effect when you are a woman however it is reversible and it will disappear if you discontinue Minoxidil. When you apply it, make sure it doesn't run down your face. You should start with 2% Minoxidil and apply it with a 0.2 mm dermaroller every second day. If you have no problems, you can apply it every day. It will take several months to see the effects. You can try to encourage hair growth by dermarolling itself, using a 0.5 or a 1 mm regular dermaroller (with or without Minoxidi)l. It will bring blood to the skin and thus nourishes the hair follicles. The easiest way to roll the scalp is to roll in one direction only. Direction from the hair roots to the hair ends. I think that the combination of Minoxidil with and dermaroller will be more successful than rolling without Minoxidil.